Prior approaching an area for anchoring ships master should investigate fully a suitable anchoring position and conduct a planned approach including speed reduction in ample time and orienting the ships head prior anchoring to same as similar sized vessels around or stem the tide or wind whichever is stronger . Final decision to be made on method of anchoring to be used , the number of shackles , the depth of water, expected weather and holding ground. More collisions between cargo ships may occur in anchorages than anywhere else, and while it is very rare for a ship to sink or for lives to be lost, as anchorages are close to land the risk of pollution is high. Ports have an attitude to their anchorages that ranges from disinterest in where a ship anchors to maintaining designated anchorages within the port areas, which are either on the chart or at the instruction of the port. However, when an accident occurs the port will place the responsibility with the ship, no matter how it occurred. This is because the Master is always ultimately responsible for the navigation of the ship. If he feels that an anchorage is unsafe he should not attempt it. Deciding not to anchor may be an acceptable position if the berth will be available in a few hours and the ship has seaway where it can either heave to and drift or slowly cruise around. It is not acceptable where there is a longer waiting time or if the ship has to navigate a long passage back to a safe area. In the latter circumstance it is possible that the ship could miss the berthing time as a result of moving to a safe area having decided that the anchorage is unsafe. Where does the captain legally stand in the face of claims at that point? It should also be remembered that many ports do not accept that a ship has arrived, for notice or readiness purposes, until the ship has actually anchored in a defined port area anchorage, effectively making anchorage compulsory. Navigation in an anchorage is the Master’s responsibility, but it is an area of great potential danger as ships are gathered in close quarters and are hampered in their movements. Unfortunately it is also an area largely ignored by the international regulations, which still expect ships to still conduct themselves as if they were on the open sea. While this is workable in theory, it is not entirely practical and while the regulations allow local port authorities to make rules for their port and roadsteads, it would take a brave port management to make navigational rules that conflict with the international regulations. A ship approaching an anchorage will find it difficult to recognise if another ship is at anchor, about to anchor or is about to get under way. Where possible, vessels will approach their anchor position into the wind and current, which means that all the other ships in the anchorage will be presenting a stern aspect. The signal for an anchored vessel during daytime is a small black ball hoisted forward, which is usually completely out of sight for any approaching vessel. At night, while an anchored vessel is fully lit, there will still be nothing to indicate that it is about to heave anchor. Anchor signals that were designed a century ago are no longer appropriate for today's shipping. More practical methods could be designed or it could be an excellent place for ports to apply local rules and proactive management. Ships within anchorage areas have varying limits to their manoeuvrability, and generally the larger the ship the less the degree of manoeuvrability. In a worst case scenario, a loaded VLCC or VLBC making a final approach may well have stopped its engine a mile from the selected position, with the ship at a speed of four knots or less. When light, particularly if deballasted ready for loading, its manoeuvrability would be severely hampered by the wind and current. At a distance of up to three cables from the anchor position and with the engines about to come astern, a vessel is not able to manoeuvre within the context of the existing rules. However, under these rules, the ship is still required to comply with the international regulations. Before using an anchor a competent seafarer should check that the brakes are securely on and then clear voyage securing devices. A responsible person should be in charge of the anchoring team, with an adequate communications system with the vessel's bridge. The anchoring party should wear appropriate safety clothing - safety helmets, safety shoes and goggles as a minimum protection from injury from dirt, rust particles and debris which may be thrown off during the operation. Wherever possible, they should stand aft of the windlass. Where the means of communication between bridge and anchoring party is by portable radio, the identification of the ship should be clear to avoid misinterpretation of instructions from other users of such equipment. Before anchors are let go, a check should be made that no small craft or other obstacle is under the bow. As a safety precaution it is recommended that the anchor is `walked out' clear of the pipe before letting go. 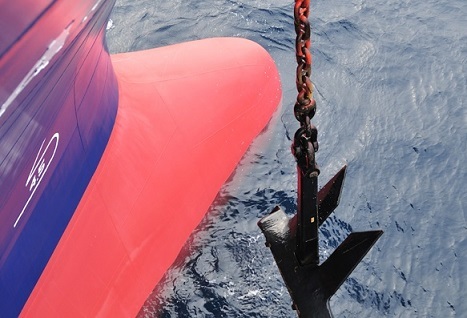 For very large ships with heavy anchors and cables, the anchor should be walked out all the way to avoid excessive strain on the brakes (and on the bitter end if the brakes fail to stop the anchor and chain). Where the anchor is let go from the stowed position, if upon release of the brake, the anchor does not run, personnel should NOT attempt to shake the cable, but the brake should be re-applied, the windlass placed in gear, and the anchor walked out clear prior to release. Cable should stow automatically. If, for any reason, it is necessary for personnel to enter the cable locker, they should stand in a protected position and, as far as possible, have constant communication with the windlass operator. Anchors housed and not required should be properly secured to prevent accidental release. Potential problems deciding 'where to anchor' ? In anchorages without defined anchor positions, a problem that often arises is that of ships anchoring too closely. Each Master will have his own view of what constitutes the safe distance that his ship may anchor from other vessels, This will take into consideration the existing or expected weather conditions, exposure of the anchorage, size of the ship, holding ground and occasionally engine maintenance requirements. However, safe distance can very much be a matter of perspective and what is acceptable to a coastal vessel would be too close for a VLCC. Take, as an example, a situation where a VLCC or VLBC anchors at a distance of seven cables from other vessels. A little later a coastal ship comes along and anchors within two cables. For the small ship this feels to be a safe distance, but not for the larger one. The large vessel may now protest about the position of the other vessel but, if the smaller ship refuses to move, the Captain of the larger ship has a duty to move his ship to a safe position if he believes there is a danger. In extreme circumstances, in a busy unrestricted anchorage, the larger ship could feasibly be on the move all day or even be forced out of the anchorage altogether. Again, this would feel to be something that the port should lead or advise on, either by defining positions or providing a ruling to an appeal. If the international regulations cannot adequately cope with the navigational difficulties of an anchorage, the anchorage itself, the way it is defined and how it is controlled become extremely important. There is a great deal that ports can do to alleviate some of the problems, and with the increasing pressure to properly control pollution and environmental damage it would appear to be a good time for a review of both new and existing anchorages. iii) Confined anchorage:an anchorage that is confined on more than one side by natural or manmade hazards. Many of the comments made here would appear to be relevant only to the second two, but it is my belief that even in the open anchorages more port assistance is desirable. Many anchorages and their limits have remained unchanged for a long period of time, despite changes in the nature of the port’s commercial activities. Anchorages were rarely ‘designed’ but instead were developed as ships anchored near the port. As the numbers increased the port developed and a line was often simply drawn around the area to limit A number of ports have carried out these changes. However, while the number is growing there are still comparatively few and during implementation there has been little agreement about safe distances for assigned anchorages. A range of ports with anchor positions were surveyed and the results showed that, at anchor, large ships use between three and a half and six cables. Most Masters who command VLCCs regard seven cables as a minimum and many require one mile, particularly in areas where the weather is variable. Often ships wonder how anchorages were drawn up? Of the ports that have established anchor positions, none have yet assumed responsibility for traffic control or advice within their anchorage areas. A busy anchorage with constant traffic movement could be compared to an airport, but it is unimaginable that aircraft would be allowed to move freely on the ground without any control or advice. The same should apply to ships within an anchorage. The pressure on ports to control pollution is so strong that a port with an accident in an anchorage, with ships moving without any traffic advice,control or designated anchor positions, might well find itself being asked serious questions about such an incident in the future. vii) in busy ports, where anchorages are defined or restricted, an overflow area should be provided. This will be where ships can anchor if the main anchorages are full, and where they will be allowed to "arrive" for notice of readiness purposes. Too many ports who provide a traffic advice service claim that they have traffic control advice, and the difference is considerable. Traffic control is when a port is capable of directing the navigation of ships from a shore based radar, with this service operated by trained and experienced professionals. Without these professionals and regardless of the radar system and its availability, the only service that can really be offered is advice. Very few modern ports exercise control or give advice on or to traffic in their anchorage areas. It is acceptable that, in open anchorages where ships can anchor where they choose and with no restrictions apart from those imposed by draught and depth, it is reasonable for the port to have no responsibility except to advise ships of traffic movements. However, even if actual responsibility is to continue to reside solely with the master. But for defined and confined anchorages more responsibility must be taken by port control as well. If a port instructed a ship to anchor in a defined or restricted anchorage that is already full, by acceptable seamanship standards, what if the ship collided with another vessel while attempting to comply? While the ship attempting to anchor will still have to accept blame, it is arguable that some level of responsibility for the incident should also fall with the Port and Harbour Master. International regulations do not and cannot adequately cover the safe navigation of ships in anchorage. The numerous accidents in anchorages that cause both damage and pollution means that some level of joint responsibility between the ship and port in endeavouring to provide safe conditions for ships using the port and the ports environment is a necessity. There must be acceptance of the fact that defined and restricted anchorages need some form of traffic control or advice and that ships should be allocated anchor positions. Ports need to make a survey of the ships using their anchorages and then plan or re-design. Anchorages should be separated by ship size with separate areas for coastal, medium and large vessels. Anchorage positions within these areas should be allocated with a radius based on the size and manoeuvring limitations of the ships assigned to them. The anchorages should be clear of through traffic routes and there must be a clear approach channel that is restricted to vessels using the pilotage service and that extends seaward beyond the furthest limits of the anchorages. The pilotage area should be clear of the approach channel and the anchorages.